How to merge content of multiple iPods in a single iTunes library? Connect your first device to your computer via the USB cable. Click "Copy to iTunes" to copy your content into iTunes. Disconnect your device and repeat steps 2-3 with your remaining devices. You can download the free demo of TouchCopy below, allowing you to transfer up to 100 tracks, FREE! TouchCopy can be used to transfer content from multiple iPods, iPhones and iPads in a single iTunes library. You should only copy or backup content that you legally own in line with our Terms and Conditions. To merge content of your iPods or iPhones follow these simple steps. 1. Download TouchCopy and install it on your computer. There are free PC and Mac demos on the site. 2. Ensure that iTunes is closed and your devices are disconnected. Then start TouchCopy and connect your first iPod or iPhone. TouchCopy will have fixed your iTunes preferences so that iTunes will not sync music or video with your iPod or iPhone while TouchCopy is running. These changes are restored when you quit TouchCopy. 3. 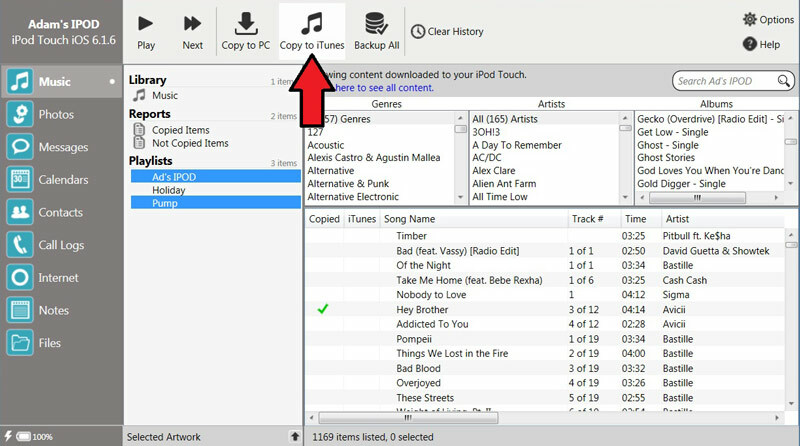 Click on "Copy to iTunes" in TouchCopy to copy all of your iPod, iPhone or iPad content into iTunes. The details on how to use TouchCopy are provided in our TouchCopy tutorial. 4. Once you are satisfied that your content is safely in iTunes, safely eject your device and repeat steps 2-3 for your other iPods or iPhones. This will effectively merge content of all your devices in a single iTunes library. 5. Use iTunes to re-sync your devices which will re-load your content back on to them, and let you add any new purchased or downloaded content to your your iPods. To do this, open iTunes, connect your device, and click on your device icon. You'll see a list of tabs for your device's media under Settings on the left(1). Click each of these tabs to enable or disable syncing of the relating media(2), as well as checking other syncing settings. Once happy with all sync settings, hit Sync(3) to sync! 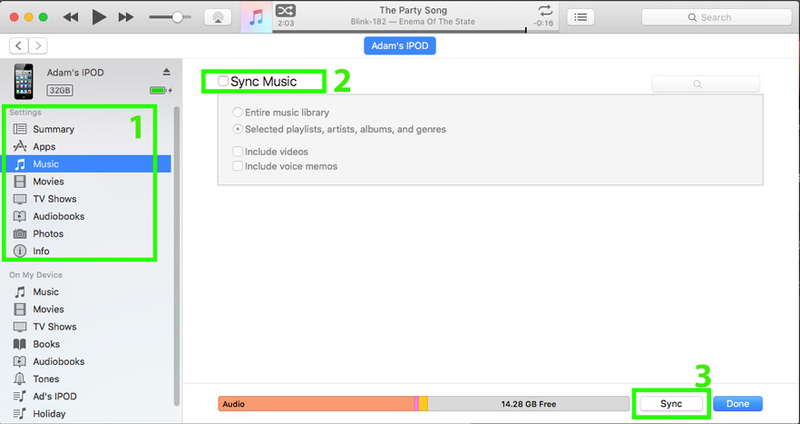 For more detailed information on how to sync a device with iTunes, please visit Apple's support article. TouchCopy supports all iPods and iPhones. For details of moving from a PC formatted iPod to a Mac see here. If you've got a Mac formatted iPod that you're trying to use on a PC please see here for more info. Does TouchCopy prevent iTunes auto-syncing my iPod? How do I transfer music or files from my computer to iPhone, iPod or iPad? Can I use TouchCopy to add new music or delete music from my iPod?